DEAR SALLY: What a common problem! I thought I was doing the right thing when I made my own garage 24 feet deep by 30 feet wide. Was I ever wrong! Not only that, I made a couple of other silly errors that have become pet peeves of mine with respect to any garage space. When garages are empty, they appear to be huge. The vast open space is often the largest space in a person's home. Looks can be deceiving. The best way for you to solve your space problem is to do a quick analysis of what you need to store in your garage. Clean out your garage first. Discard accumulated trash and sell things you no longer need. Arrange the remaining items in the manner you feel most comfortable. Undoubtedly you will see that things are still cramped. Calculate the necessary width and depth of the garage that will give you adequate walking room around and between all of your possessions. With these calculations in hand, you now have the new floor plan footprint of your garage in hand. Is a garage addition in your future? 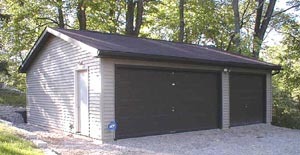 Save time and money by using my Garage Addition Checklist. I offer a 100% Money Back Guarantee. My guess is that you will come up with an interior size of 32 feet wide by 26 feet deep with 12 foot high walls. This garage will provide you with room to easily house all of the things you have plus give you the opportunity to construct a useful loft in one or more corners of the garage. A common problem in most garages is not enough side clearance when you open a car door. Car doors seem to attract bicycles, garbage cans, shelving, and any other items you have placed along a side wall. Make sure that a garage door opening begins no closer than four feet from a corner. Most garage door openings (including mine!) start two feet from a side wall. Garage doors can also be a problem. If you want a large double door, make sure it is 18 feet wide by 8 feet high. This door will give you the extra space you need in the event you have oversized vehicles. If you desire single doors and have a large sports utility vehicle (SUV), make sure at least one of the doors is at least 10 feet wide to accommodate the vehicle's mirrors. Large SUV's appreciate 8 foot high openings as well. If your budget will permit it, consider using attic storage trusses. These roof framing members allow you to install all sorts of goodies up in space that typically goes to waste. They are made so that you can't fully stand up in the space, but can easily move about as there are no irritating truss cross members to get in your way. Be sure to plan for your electric needs. Install two or three separate 20 amp circuits so that you have plenty of power for large tools. Do not forget to install both indoor and outdoor outlets adjacent to the garage door(s). This will eliminate the need for extension cords for many projects. Place outlets three feet off the ground for easy access. Be sure you have several outlets at your proposed workbench site. Most model and national codes require that all readily accessible outlets and circuits must have Ground Fault Circuit Interrupter protection. Skylights are wonderful in a garage. They allow you to work inside on many days without the need for artificial lighting. Consider a through-the-wall fan to provide ventilation on hot days or while you work with finishes or chemicals that require vast amounts of fresh air. Mount this fan in such a way that it will pull air across the garage from a slightly cracked door or a fresh air intake port. If you want a book to help you design and build a really unique outdoor storage building, then The Backroad Home is a good place to start. This large format 96 page paperback book is a collection of cottage, cabin, barn, stable, garage, and garden shed plans. The thing I like about this book is that it may stimulate an idea for a unique styled outbuilding. If you like the design but the structure is too big, simply downsize the plan to fit your needs. My garage is on the small side and I had been putting off reorganizing it for a couple years now. I really needed some of these ideas. Good job Tim, the only thing I would add/change is to put in a couple of Sun Tunnels instead of/in addition to the skylights. This is especially true if you can't put any kind of loft due to local regulations (Trusses only). As you know from your visit, my buildable area on a somewhat narrow lot resulted in a 20' x 36' deep garage. I wish it could have been 24' wide as you suggested. Parking one car forward and one backward leaves enough room for each driver to exit the car in the garage, but a passenger would have to exit before a car enters the garage. I built a wall across the back of the garage so that the car area is 20' x20' with a 36" wide doorway in the middle of the wall. The result is a reasonable 20' x 16' area for my workshop and storage for a lawn mower, snow-blower, generator, bikes, grill and lumber. All of the many outlets are on two separate circuits, with the top outlets on one and the bottom outlets on the other. A third circuit powers all overhead lighting, outdoor lights, garage door opener, wall air conditioner, heater and outlets for overhead cords. So far no circuit breaker has been tripped. One other feature has been useful, which was to extend the roof overhang and wall above the overhead door by three feet. This provided extra storage inside, plus an area for the grill to be used when there was rain or snow falling. Great advice Tim, but late for a lot of people.....but why don't the builders already know this ???? Is this a big deal to rebuild the door and make the opening larger ? just how much of a problem this really is, if he could find someone to redo this and how expensive.....he did not complain to his friend,(as he did it free for him, even furnished the lumber, etc) they laughed it off as a joke,but it never was redone for some reason, but I know he would like to get it fixed and be able to get his riding mower out of the garage.....what are your remarks on this ? Sounds like really poor planning and maybe too many beers on this job. I can't quote numbers because there are too many variables. I'd have to see the shed. I am amazed that people are still building two car attached garages when for just a little more money you can have a three car garage. The third car space adds just a little more cost for longer trusses, a little bit more for roofing and third garage door. The two side walls and the attached back wall stay the same. The extra cost was under $1000 on my 1977 built house.